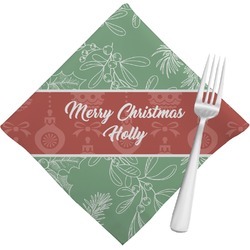 Designed to be folded & placed on the plate, with personalization positioned perfectly. Give your table a polished look in no time when you whip out our personalized cloth napkins when company comes over for dinner!! They are a simple way to add an extra pop of color with little effort. You get a set of 4 napkins and you can personalize all four with the family name, or personalize individually with each person's name. Our dinner napkins are designed so that when you fold & put them on the dinner plate, the personalization is perfectly positioned. The first picture is of the folded napkin, while the second picture shows the napkin unfolded. Elegant designs with monograms can give your table a sophisticated look, while our more modern designs give a trendy feel!! 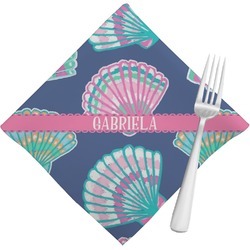 We haven't forgotten about the little ones... we also have cloth napkins that have whimsical and themed designs that will accent a child's birthday party perfectly. 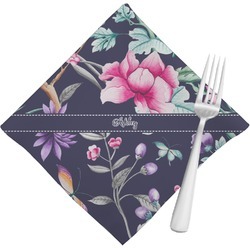 The cloth napkins are durable, reusable, and have a light sheen finish. Let's also not forget that when you use them you are helping eliminate paper waste in the environment.